You stayed out drinking ‘til 3am last night, and now you’re swigging Gatorade over the toilet bowl in your tiny studio apartment bathroom and making false promises about never, ever drinking again. You have exactly three options: A) lie there and feel sorry for yourself; B) sweat the booze out at the gym (hahahah! ); or C) fill yourself with some delicious, reviving food. While the corner bodega’s bacon, egg & cheese will always work wonders, New York’s got tons of other incredible hangover foods that demand your attention. And since plenty more hangovers are likely on the horizon, you should have no problem hitting them all. These spots in particular will give you all the strength you need to -- let’s face it -- probably just trek back into bed. There’s arguably no better hangover cure than a plate of chicken and waffles, and here to appease (in hand-held form, no less!) are Top Chef contestants Jeff McInnis and Janine Booth. 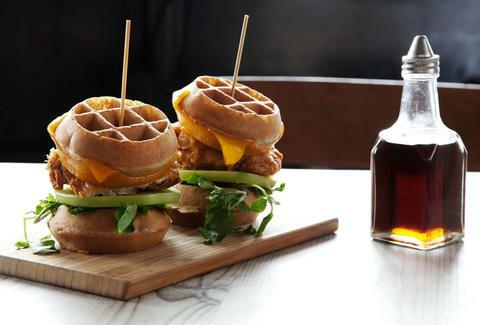 Their towering sweet-and-savory sandwich at the East Village's Root & Bone features tender yet crunchy chicken tucked between two buckwheat waffles covered in cheddar cheese and served with whiskey-infused maple syrup. Motion to eat waffles with our hands from this day forward. If you can manage to emerge from your dimly lit cave, nurse your hangover like they do in NOLA. This tiny sandwich shop offers Big Easy-inspired bites and drinks like Zapp’s potato chips, Ben-Yays, chicory coffee, and Big Shot soda -- but the real morning-after rescue is the half-and-half po-boy that’s packed with fried shrimp and oysters, lettuce, tomatoes, mayo, hot sauce, and pickles between two slices of bread shipped directly from NOLA’s own John Gendusa Bakery. While the end might feel near, one look at the white picket fence, colorful shutters, and bright bar stools will instantly restore you. 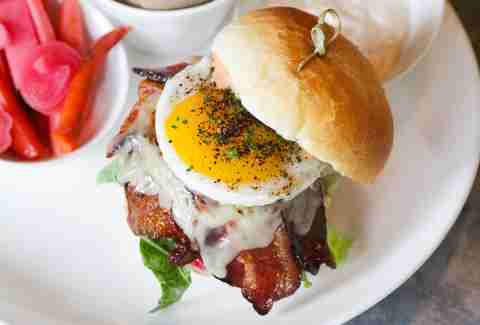 Sure, there are plenty of places to get a great, hangover-helping burger in New York. But when you need something to take the aching away ASAP, the heavy-loaded namesake burger at this Brooklyn Heights fave is a must: a hefty grass-fed patty topped with Applewood-smoked bacon, aged cheddar, pickles, lettuce, beet ketchup, and a runny egg safely sandwiched between a house-made potato milk sesame roll. After that fourth round of pickleback shots last night, you desperately need to bring out the big guns. And although pretty much anything on this menu (a Cap’n Crunch-crusted chicken sandwich, deep-fried mac & cheese balls with Sriracha, breakfast lasagna Benedict) will soak up every last bit of the night before, the real knight in shining armor is the breakfast burrito. The combo of scrambled eggs, sausage, crinkle-cut fries, cheddar, Sriracha aioli, and scallions will have you feeling like a human again after just one bite. Often, a bagel is all you need, and when that’s the case, look no further than Black Seed’s lox-and-tobiko spread number. 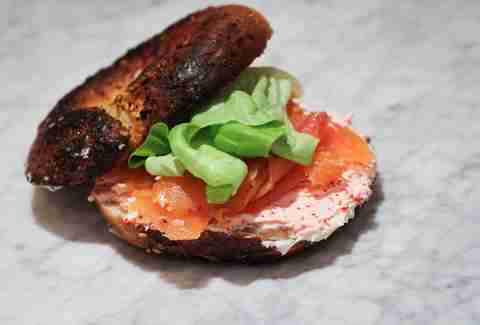 The Montreal-style bagels are given extra love and care -- that is, they’re hand-rolled, boiled in honey water, then baked in a wood-fired oven before being dressed with salmon, tobiko spread, and butter lettuce. And because it’s always prudent to stock up on carbs, double up with its first cousin -- a bagel with smoked salmon, cream cheese, capers, tomatoes, and onions -- which also works its magic on throbbing headaches. Nothing sounds worse than sweating out a hangover at the gym. But breaking a sweat while stuffing your face with steaming soup dumplings may actually be the ideal antidote. 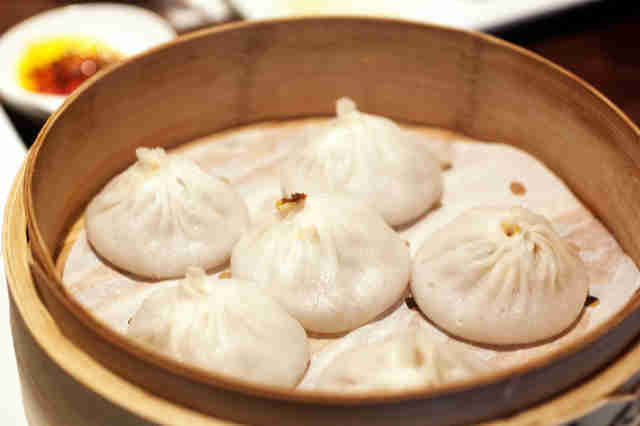 The hangover hero at this Shanghainese restaurant is the Kung Fu Xiao Long Bao -- the piping hot pork broth, which is boiled daily and cocooned in a thinly hand-rolled dough, will warm you up and have you feeling better in no time. If there’s a comfort food that can rectify the roughest of nights, it’s a heaping plate of nachos -- specifically the kind served at this Prospect Heights Mexican joint. Order a plate piled high with crispy chips, plenty of cheese, cream, and salsa, and slowly feel that hangover wash away. It's an option to add chorizo, but you'd be completely crazy not to. Kenny Shopsin's pint-sized LES eatery boasts literally hundreds of menu items, many of which are insanely creative, hangover-worthy mashups (looking at you, mac & cheese pancakes). 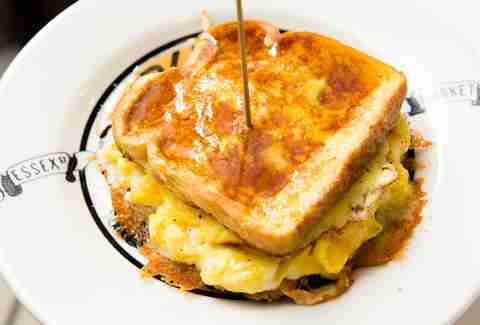 But the real Saturday-morning go-to here is the grilled cheese. And this is no wimpy white bread diner grilled cheese, either -- we're talking about a two-layer French toast grilled cheese, stuffed with cheddar and topped with poached eggs. It's probably not the worst idea to throw in those mac & cheese pancakes, too. 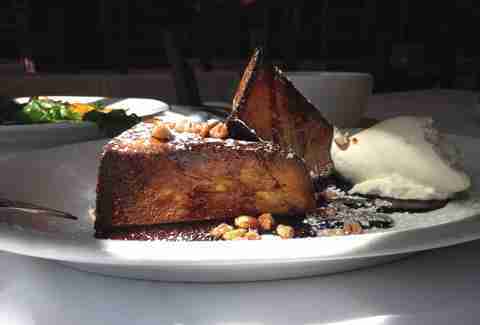 The pecan pie French toast at this Brooklyn comfort food spot proves there’s quite literally nothing that sugar and carbs can’t cure. Breakfast, dessert, and all-around weekend-reviver, the plate showcases two hefty pieces of bread capped with toasted pecans, powdered sugar, and whipped cream. The perfect finishing touch -- bourbon molasses -- is alone worth rolling out of bed for. Devouring that entire box of greasy pizza last night in your wobbly state probably wasn’t a great idea, but luckily, the folks behind this SoCal-inspired joint have your back with a refreshingly restorative breakfast bowl that’ll make you feel good, and good about yourself. Brimming with fresh berries and crunchy granola, it’s sure to right even your most catastrophic wrongs from last night. For those mornings where the sound of someone breathing resembles the siren of a fire truck, you need something soothing -- like the shakshuka at this Williamsburg hangout. 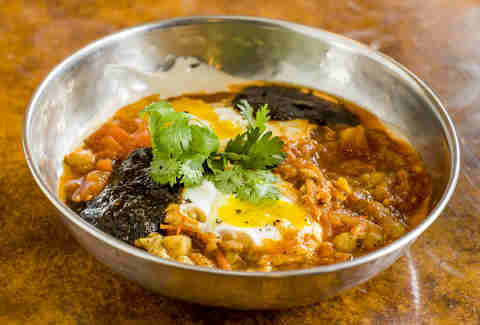 The steaming skillet is filled with two poached eggs, matbucha (a sauce made with tomatoes, roasted bell peppers, chili pepper, and garlic), chickpeas, harissa, and unexpected touches of tahini and eggplant. And there’s more where that came from, too. Drawing from places like Spain, Turkey, Lebanon, Israel, and Morocco, the kitchen also serves up flavorful falafel and lamb kebab with black baba ghannouj, grilled onions, and tomato salsa -- both of which are the perfect remedy to one too many vodka sodas. This Williamsburg burger joint’s mac & cheese will instantly transport you to the comforts of your childhood home (assuming your mom made gourmet mac & cheese and not Kraft). The key to this mac & cheese is the radiatore pasta, which perfectly soaks up the rich and nutty blend of Gruyère, Cheddar, and Parmesan -- but it’s the salty and thick chunks of bacon and crunchy bread crumb-topped crust that make it a true hangover savior. 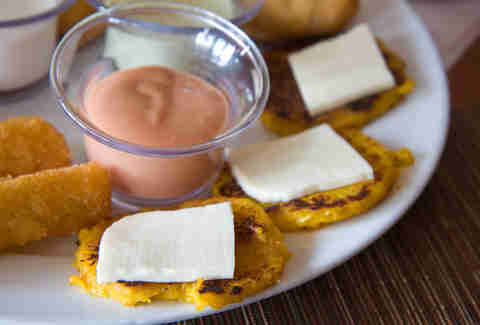 The palm-sized arepas at this unassuming Queens spot may seem small, but they're loaded with enough fillings (from flavorful Venezuelan-style shredded beef; to Guyanese cheese; to beef, black beans, fried sweet plantains, and white cheese) to give woozy post-partiers a much-needed reboot. If chewing sounds like too much work, go for the brown sugar lemonade, or the traditional chicha: a sweet, thick drink made of rice and cinnamon. If you’re craving stacks of greasy meat and cheese to soak up all the drinks you consumed past 2am last night, look no further than this burger truck turned food stall at Urbanspace Vanderbilt. While you can easily order a single or double patty, if you’re really trying to survive the rest of the day, you’ll opt for the three-patty burger topped with melted American, caramelized onions, and thick hardwood-smoked bacon on a buttery and perfectly grilled potato roll. Alisha Prakash is a contributing writer at Thrillist. Research for this story led to some epic nights followed by some brutal mornings followed by some delicious food. Follow more of her musings on Twitter (@alishasays) and Instagram (@alishaprakash).